Very impressed with this rug. Some shedding but is to be expected. Great quality. The Nourison hand-tufted Caspian wool rug adds luxury and comfortto living and dining rooms. The wool accent rug is made from100-percent wool that will keep its shape and look smart withoutcrumpling. The floral design of the rug and its green color will gowell with any home decor. All rug sizes are approximate. Due to the difference of monitor colors, some rug colors may vary slightly. Overstock.com tries torepresent all rug colors accurately. Please refer to the text abovefor a description of the colors shown in the photo. The colors of the rug are true to the picture. I would call it a true sage w/ a hint of grey to mute the green. I had purchased most of my rugs from overstock and always ordered XXXXXXXX brand. I think this is a higher quality rug. the pile is extremely dense with a narrow, tight twist. The rug is from XXXXXXXXX XXXXX XXXXX Collection. This rug is exactly what we needed. When we bought a new couch, we also needed a new rug to tie the room together. After looking at hundreds of patterns and colors, we found this rug at a retail store in our city, but it cost more than we wanted to spend. Researching the same rug online, we were thrilled to find the exact rug for less, and the best price was Overstock's, where it was more than $** less! The colors are true to the picture shown, and the muted tones are exactly the look we wanted. We have bought a number of items through Overstock.com and have never been disappointed with our purchase. If you are thinking of ordering this rug and think it is yellow or gold you shouldn't order it. It is GREEN - various shades (sage and moss). Even the "white" areas have a tinge of green in them (sage). So if you don't want a green rug look further. Not sure why Overstock can't take a picture that is more representative of the actual color? I've attached mine. Since I don't mine these green earth tones I'm keeping the rug. Ordered on Monday and received it on Friday, which I consider great service. Double wrapped, I used double sided tape to hold down the two ends which has gotten the rug to lay flat in two days. I have vacuumed it three times already (4 days) and it has filled up the tank on my Shark each time. This shedding or dust makes the colors in the rug wash out so after vacuuming it looks brighter and colors are a little more vivid. The colors are muted like a water color painting. So if you are looking for a subtle rug in green shades this is for you. Rug looks like it's been down for years rather than brand new. Not sure how it's going to wear, but since it's under a dining room table not too worried about that. Does feel nice under foot. The description says it's 3/4" thick but in the specs it says 1/2". 1/2" is the correct thickness. The rug is truly not bad for the price but there have been issues where we thought we would return to vendor. 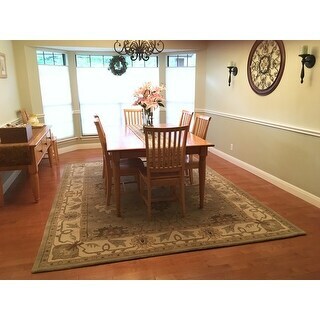 The color represented in the photo on the website shows the rug to be more tan and some of the reviews state that the rug is identical in color as shown. This is NOT true--the color of the rug is more in the light green tone with very little tan being evident. Decided to keep carpet and live with it! The other issue is the flacking off of the wool, which is supposedly going to stop but we have several area wool rugs and they do not exhibit the degree of breakdown that we are seeing with this carpet. The rugs we have are more expensive so that may be the difference....quality. All in all. the carpet does the job and looks presentable plus the thickness makes it pleasurable to walk on. Would always recommend looking at the thickness before purchasing a hand tufted carpet....the thicker the better! We are very pleased with the size, color (true to what we saw on the website), material and thickness of the rug. The delivery time was unbelievable (4 days) and the rug was well protected in heavy plastic. We also purchased a pad to go under the rug to protect our new hardwood floors. I would definitely go to Overstock.com in the future when looking for something to buy for the house. This rug is wonderfully thick and laid flat in no time. The colors are lovely, although perhaps more muted than I expected. The design is quite large and somehow has a flavor of a Southwestern style. Still, it goes nicely with our traditional furniture and gives the room a bit of a unique touch. This is a beautiful wool rug at a great value. Shipping was 5 days earlier than originally estimated. The colors of this rug are pretty much as depicted in the item's listing. The boldness of the color varies with the changing lighting in the dining room over the course of the day. I've included a picture in my review as well. The sage color matches very well the 2 tones of sage in my dining room. The 8'x10.5' size fits my 4' x 6' table and chairs well. I only wish this came in a size larger than 8' x 10.5'. I'd get one for my great room as well. I expect to be vacuuming more frequently, until it is broken in, but no matter, I love the rug! I am very pleased with my purchase of this rug. The colors are soft and beautiful, look just like the photo. It is primarily sage green, with tan, a little warm brown, and a little slightly-bluish gray, actually looks gray with no blueish on most angles.. It looks great on my light wood floor in my dining room. I purchased a 1/4 inch felt (no rubber) rug pad, and it is wonderfully soft underfoot. My rug has shed a little bit, but not excessively, and does not need a lot of vacuuming. I believe this rug is best for transitional style decor. This rug is absoulutely stunning. It is so pleasing to the eye. The muted colors are beautiful with our marble floor. I looked at hundreds of rugs and could not be more pleased with the quality, beauty and price of this rug. Thanks to a previous reviewer who stated this rug had a southwestern look I ordered it and I am glad I did. It is a quality wool rug with soft colors in sage green tones. It has shed very short pieces which I think left from the trimming of the rug in manufacture. This seems normal and has not affected the thickness of the rug. The rug goes well with the Arts and Crafts decor of our home. The price was more than fair and the packing and shipping allowed the rug to arrive in great condition. This rug was better than expected. The color was a soft muted green and looked like the picture. The quality seems to be good. Very good value. Although the rug looks nice, the constant shedding of small fibers fills my entire apartment. I have complained about this and was told that it would take time, but I don't see any improvement. My dark wood floors need daily vacuuming to remove the fibers, which even find themselves in other rooms of the apartment. I don't use the vacuum beater, and no matter how many times I vacuum the rug, the canister is always full. I am so sorry I bought this rug - shedding even worse than my previous wool rug. I DON'T KNOW WHAT TO DO - HOW CAN I GET RID OF IT??? I love this rug. Colors are a bit lighter than in the photo. Still shedding a bit, but I expected this. There was an odor, but, I sprinkled baking soda and vacuumed it the next day - repeated and then the odor was gone. It's soft and pretty. The price was excellent. I was really skeptical about ordering online, but after shopping around for similar wool rugs, I saw that store prices were much higher for the same type of rugs. I'm very happy with this rug. The rug has beautiful colors. Muted and nicely blended. Nice design, The plush is very thick and has a good feeling. Beautiful, long-lasting. I bought this first 7 years ago and have just bought another one just like it as the price is more reasonable than having the old one cleaned. We have had this rug for over three years and still just love it. I have 2 and both are wearing great, even with dogs and three kids. Love this rug. Excellent quality. Colors are true to picture. I purchased this rug for a meeting space that gets used frequently and it has held up very well and still looks great! It is very soft and would look great in any space! "In the Description it says this rug is .75 inches thick (3/4") but in the Specs it says 0.50 inches thick (1/2"), wondering which is it?" This rug is .50 inches thick. We apologize for the confusion. "What are the exact dimensions of the rug? I see that the website says the size may vary slightly from the stated dimensions." As these rugs are individually made, there will be a slight variance in the finished dimensions. The exact dimensions are 96 inches x 126 inches x .50 inches. "Well...its been almost 9 months since I purchased this rug and the "fuzzies" have not gone away as promised. I am constantly pulling out my vacuum cleaner to get rid of these annoying fuzzies on my dark wood floor. When I vacuum the rug, the fuzz fills the vacuum canister. Anyone wearing dark colored slacks and walking on the rug ends up with fuzz on their clothing. Although the rug's colors look good, overall this problem has not resolved and I am considering getting rid of it since I can't continue to battle the fuzz problem. HELP!!!" Hello Bella, I have had this rug for 11 months and do not have this problem. 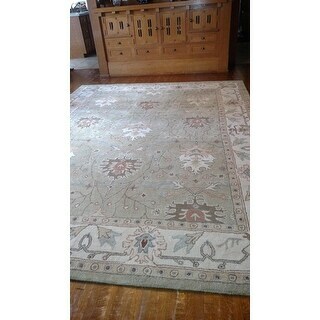 I have bought some similar ones on Overstock and believe this is a very good, and attractive rug for the price. I am wondering if it is your vacuum cleaner. The "old fashioned", upright,w/o disposable bags work best on this. Since I got rid of that and purchased one of those "stick types", although it is cordless and lightweight, it just does not vacuum as deeply and the canister is so small, you are emptying it much more often. I often wonder if this is really the problem when I see complaints about shedding on rugs here as so many people are using this type of vacuum now. Hope this helps!! Deb 123: Thank you for your response. The vacuum is not the problem - I am using the newest model Dyson. This rug's fibers spread even without vacuuming. Like I said, just walking on it will disperse the fuzzies. Overstock's answer to my original comment about this is that the problem will go away in a few weeks but, obviously, it has not. I purchased a pad to go with it and now I am going to get rid of the whole package. I WOULD APPRECIATE OVERSTOCK'S RESPONSE. Thanks. I've had the rug for a few months & initially noticed fuzzies coming off the rug...something that I've experienced with all woolen carpets I've had btw. I used my Dyson to vacuum them off and haven't had the problem reoccur. "The rug sheds so much that the fibers fill my vacuum canister each time I vacuum. I don't use beater on va yum. Help...what can be done"
Hello Bella K., you can expect most rugs to have a few "fuzzies" for the first few weeks. This is normal, so don't worry, and the shedding should decrease with time. Thanks for shopping with us! The review from the customers, the pile height, the price and the promo code made it an absolute decision to purchase. "Hello, I wonder if anyone familiar with wool rugs can answer a question for me. I purchased a wool rug from Overstock a year ago and every now and then would step on something hard and on closer inspection i would find in the rug a hard white little knub....I figured it was hardened glue? Today I received this rug in the mail and while walking around on it for the first time....stepped on some hard pointy section and looked closer and its the same exact hard white glue looking knub as the other rug. Granted you have to get down on your knees and really spread the wool fibers apart to see it but it is very uncomfortable when stepped upon....and when I try to remove it...sometimes it crumbles in little white crumbs. Its not consistent throughout either rug....just here and there....makes me think this is just part of wool rugs in general....anyone have help?!" Thank you for your question, Kaltruvae. It’s the latex glue that the factory uses on the back of the rug to affix the scrim to the pile. Have a great day. "Is their a runner in this pattern"
Hello nwallacce, Unfortunately I was unable to find these particular Rug in a runner of this pattern on our site, but we do have a large variety of runner, like the Nourison Hand-Tufted Caspian Multicolor Wool Runner Rug (2'3" x 7'6") Item #: 13821270. Please feel free to contact us again with any further questions. Thank you for shopping with us! 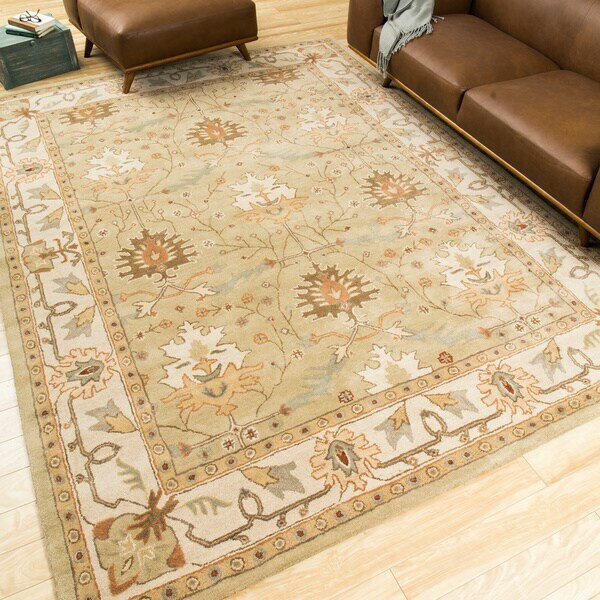 Nourison Silk Touch Camel Rug - 7'9" x 9'9"
Nourison Hand-Tufted Caspian Traditional Wool Rug - 3'6" x 5'6"